What Is a CRW File? A file with the CRW file extension is a Canon Raw CIFF Image file. These files are unprocessed and uncompressed images taken with a Canon digital camera. CRW files are structured similarly to the TIFF file format. The CRW format is no longer used in newer Canon cameras because it's been replaced by the CR2 format. The last specification for the format is Version 1.0 Revision 4, dated late 1997. You can read all about it in the CIFF Specification on Image Data File [PDF]. The earlier digital cameras that support the CRW format includes Canon's EOS6D, EOSD30, EOSD60, EOS10D, EOS300D, Powershot Pro1, Powershots G1-G6, and Powershots S30-S70. The Canon Raw CIFF Image file format is similar to other raw image files taken by other digital cameras, like Sony's ARW, Nikon's NEF, Fuji's RAF, and Olympus' ORF file formats. You can open a CRW file for free using IrfanView, XnView, Microsoft Windows Photos, Able RAWer, RawTherapee, and Microsoft Windows Live Photo Gallery (with the Microsoft Camera Codec Pack installed). The software that comes with a Canon camera should also be able to open images that are saved in the CRW format. If at this point your CRW file isn't opening in these programs, I suggest running it through one of the file converters mentioned below so that you can save the image to a format recognized by most image viewers. Though these programs are not free, you should also be able to open a CRW file with Adobe Photoshop, Adobe Lightroom, ACD Systems Canvas, XARA Photo & Graphic Designer, AZImage, and probably some other popular photo and graphics tools as well. If none of these programs can open your file, be sure you're reading the file extension correctly and that it isn't really a file that just has a similar-looking file extension like an ESW, CRX, ARW, or RWT. 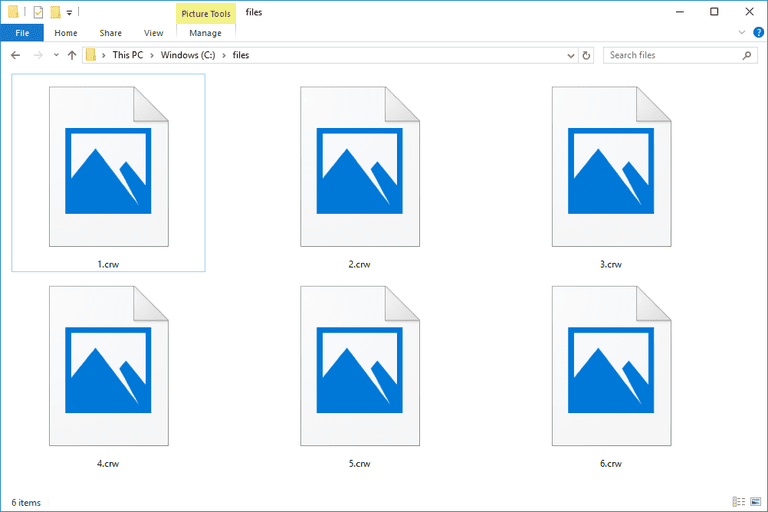 If you find that an application on your PC does try to open the CRW file but it's the wrong application or if you would rather have another installed program open CRW files, see our How to Change the Default Program for a Specific File Extension guide for making that change in Windows. There are lots of different free file converters that can convert popular image formats like PNG, JPG, GIF, etc., but the quickest way to convert CRW files is Zamzar because it's an online file converter. Online converters mean you don't have to download a conversion tool, but the tradeoff is that you have to upload your file to the website and then download the converted one. Zamzar converts CRW files to JPG, PNG, TIFF, PDF, and several other image formats. Another online CRW converter similar to Zamzar is CRW Viewer, but I haven't tried it myself to see that it works. If you want to convert CRW to DNG, you can do so with Adobe DNG Converter.